Prepay any seasonal program and save 5% and enjoy a WORRY-FREE summer. * Weed control products are applied in accordance to provincial and or local by-laws and within IPM guidelines. Program services may be altered or substituted to comply with provincial regulations and new developments that may provide more effective control. Management is defined as a process employed to control the incidence and reduction of weeds & turf damaging pests while promoting a healthy growing environment. It is neither reasonable nor practical to expect total weed and crabgrass control under new laws. When we work together our programs will provide you with a healthy lawn, Guaranteed! Core Aeration small cores of soil are removed to reduce compaction improve root growth. It also allows better uptake of nutrients. Top Dressing adds organic matter to the soil and improves micro organizims which promotes better thatch breakdown and moisture retention. Mechanical Slit Over-seeding improves your lawns density and introduces heartier cultivars with endophytic properties. Vegetation Control controls unwanted vegetation growing on your patio, driveway or walkways. Shrub Maintenance we can provide a seasonal, timely trimming of perennials and shrubs to improve shape and provide the desired look for your property. A weed can be defined as any plant growing in a place it is not wanted. 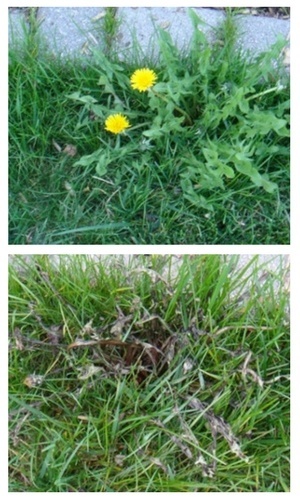 Weeds are opportunistic plants that compete with your lawn for space, water, nutrients and sunlight. A thick, vigorous, healthy lawn is your best defence against weed invasion. A dense stand of turf can compete successfully with weed seedlings for light and nutrients thereby minimizing weeds within your lawn. Weed invasion can be kept at bay with a lawn care fertilization program and proper cultural practices. By adding one of our seasonal lawn care programs with the addition of a weed control product will minimize weed occurrence and create a healthy lawn. Homeowners who demand fewer weeds must resort to a program or application which includes the use of herbicides. The following service is included in all of our programs to control weeds. Applied when weeds are actively growing in the spring summer and fall. FIESTA™ is a fast acting selective bio-rationale herbicide. Developed by Neudorff North America for broad leaf weed control such as dandelions. It is made from naturally occurring Iron (Fe) that has been chelated to form FeHEDTA. It works as a selective weed control herbicide and will not kill the grass it is sprayed on when used properly. It’s been proven and provides good results on many different types of weeds. It works extremely fast and control results are expected in less than 48 hours! It is odourless and orange in colour! It is an alternative to the traditional three-way chemical herbicides such as Killex that have been banned in Ontario. For more information visit the Official Ontario Environmental registry of Fiesta. The government agency that regulates herbicides (the PMRA) is very clear that any product that is used to kill weeds needs to be registered under the Pest Control Products Act. It is illegal to sell or use an unregistered product to kill weeds. We utilize only commercial grade registered products sold to licensed operators to control weeds. They are always applied at the appropriate times to achieve the best results. Our Programs are Guaranteed* to show results even with the Provincial Pesticide ban. We can reduce weeds in a safe and environmentally responsible way. Always safe for your family and pets. We offer our customers the ability to select one of several programs suited and customized for your budget. All seasonal programs are designed and developed to create a healthy lawn and safe environment by focusing on proper nutrients, proper care and promoting plant health. We incorporate the most current Weed Control products and techniques available to guarantee you visibly fewer weeds! (NEW FIESTA Weed Control). Be rest assured that all herbicde applications are performed in compliance with Integrated Pest Management standards in mind. When our customers work together with us, follow our technicians helpful advice and,incorporate proper mowing and watering regimes visible results will be Guaranteed! In addition to our programs, customers have the option to select Individual services such as organic top dressing & soil amendments, shrub and tree maintenance,or lawn pest control. We choose to use only professional premium fertilizer products in granular form that incorporate innovative design with agronomics to produce a proprietary coating process (PCSCU). This delivers the highest nitrogen level with the lowest sulphur content available today. This technology delivers more reliable, more predictable slow release of nutrients so your lawn receives a 6 week period of steady feeding. Our Organic based fertilizer products have all the same technologies as the traditional fertilizers with the added benefits of organic matter. This improves soil structure, increases microbial activity and water holding abilities and will improve the overall vigour of your lawn. How Do Organic Fertilizers Work? Have you ever noticed that good quality soils have a “nice earthy smell”? That smell is actually the by-products of billions of soil creatures breaking down organic matter into nutrients that can be taken up by plants. Organic fertilizers are not just food for your plants but food for the living organisms that produce quality soils.